In search of a private island, a woman steps out of her own personal trap and into another’s, scratching and clawing at the air. In the humid darkness, her fate is washed down a drain and drowned in a brackish bog, at the whim of a mad matriarch. But we all go a little mad sometimes…don’t we? Alfred Hitchcock’s piè ce de rè sistance may be the shower sequence, as Marion Crane begins to metaphorically wash her sin away, deciding to return the stolen money. But the consequences of her felony will outweigh the crime itself, as a diaphanous figure looms behind the shower curtain with eyes that burn like coal. Bernard Herrmann’s ripcord score shrieks with slashing strings, and though Hitchcock never depicts one puncture wound the quicksilver editing allows imagination to trump revelation. Her palsied hand clutches at the shower curtain and she slumps forward, the dull thud on the tile floor chilling and final. A match cut shows thick blood spiraling down the drain juxtaposed with her lifeless eye now starring into the abyss, as the camera pulls slowly back from extreme close-up. The most disturbing scene of the film may be the one that precedes this murder, as Norman and Marion share company in his parlor surrounded by stuffed birds. The conversation proceeds from small talk to deep insight, as Marion recognizes her own mistake and Norman slowly transforms his boyish charm into accusatory malignancy. 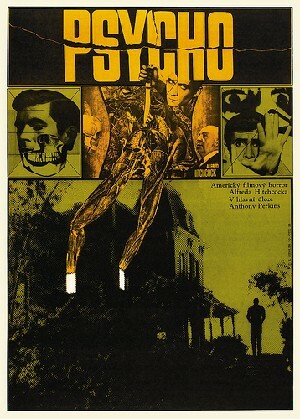 Hitchcock often frames Norman in low angle with the birds hovering above him in raptor-like frenzy, his Adam’s apple bobbing up and down like a bird being fed by its mother. In this case, Norman has been totally consumed by his mother! Norman leans towards Marion and spits his venomous judgment: “People always mean well! They cluck their thick tongues and shake their heads and suggest, oh so very delicately!” These dark reflections foreshadow the tumultuous events and derail the entire narrative structure, shifting the final two acts into a murder mystery: it’s one of the most dramatic paradigm shifts in popular film…a $40,000 McGuffin! PSYCHO is Hitchcock’s most famous film and arguably his best, and has become the foundation for an entire genre that continues to influence modern cinema.